This is an “eyeballing” recipe—notice, there are no measurements. But the outcome is yummy, so go ahead, be brave and wing it with me on this one! The chicken is super tender, the rice is a healthy alternative to pasta, and the veggies in tomato sauce bring the two together perfectly. I use a rice cooker and a George Forman Grill to ensure results easily and timely. Feel free to use what is most comfortable for you—being aware to adjust timing accordingly. Take a shallow glass baking dish and pour enough EVOO to coat the chicken in (for me that usually means a solid coating across the bottom, then I dredge the breasts in it several times to coat the meat). Place the split breast pieces in the oil and dredge both sides until well coated. Shake a generous coating of the 3 seasonings onto the breasts. Flip breasts and repeat coating with the seasonings. Let the chicken marinate in the fridge for the day. Start the rice in the rice cooker. Turn on George Foreman Grill, give it a light spray of PAM and set on medium heat. Place onion and mushrooms in a large skillet. Timing is everything—the rice should take about 25 minutes, the chicken should take about 15 minutes, and the onions and mushrooms should take about 10 minutes. One by one, pick up the chicken breasts, and allow excess oil to drip into the vegetable skillet, placing chicken on the George Forman on a medium heat setting. Transfer remaining seasoned oil into the skillet, scraping as much of the oil and herbs onto the veggies as possible, and prepare to sauté vegetables. Sauté veggies until tender and turn down heat to low. Stir tomato sauce into skillet and heat through. 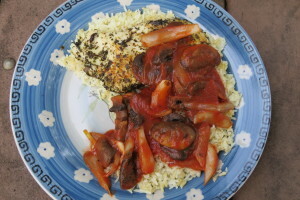 Plate one piece of chicken breast on a bed of rice, and cover with the tomato mixture.